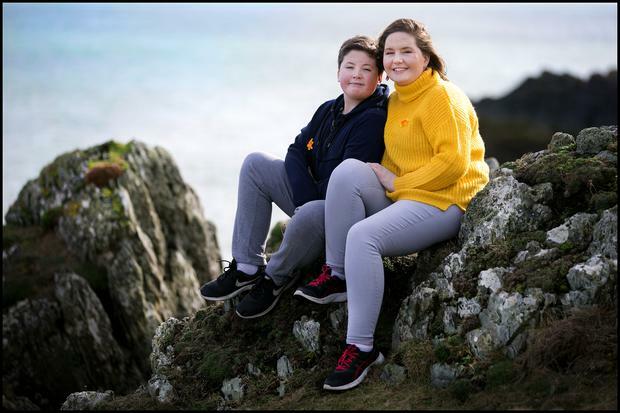 Eileen Rushe is thankful she became a mum at the tender age of 20 and now she looks forward to her son’s confirmation while hoping for the all-clear from cervical cancer. Eileen is only 33 and has already been through so much in her young life. She became pregnant with her son, Seamus, now 12, while in first year of college. And her son’s father, John Byrne, 32, tragically passed away in July 2017. “You have to go forward, rather than back and some of the stuff I’ve been through has been very hard,” Eileen said. “But everything that happens encourages me to better deal with the next issue. Eileen has just finished intensive cancer treatment, including internal radiation - something which is likely to spark the menopause early while doctors explained there would be no more children. “The doctors say, at the moment, I’m probably in perimenopause. And then I’m set to go into full menopause,” Eileen said. “I won’t be able to have any more children and I’ve already started with a higher body temperature and I’m only 33. “But the way I look at this is, for me, it’s not the worst situation. “I have a 12-year-old son and I know for other women who haven’t had that chance of becoming a mother, it’s a far more painful thing. Eileen was diagnosed in December while being treated for precancerous cervix cells the previous 18 months. The mother, from Termonfeckin, Co Louth, said she couldn’t stop to think how did this happen, as she had to concentrate on getting well. “I was told they were treating me to cure the cancer and despite what the treatment does to my body, if it means I can survive, that’s all that matters. “I can cope with it, just to get through this. Because I already had my son, nothing else was worth dwelling on. “I’m helping out with weddings and I just want so badly to do normal things. My son’s Confirmation is in May. “I’m due to get the results a week before my sister Siobhan’s wedding in May but I asked the hospital to give them me a week later, as I want to enjoy the family wedding. “I’m hoping by the Confirmation and at the end of May, I’ll get the news that I’m cancer free. Eileen praised St Luke’s Hospital in Dublin, where she’s been treated and the Irish Cancer Society, for being there for advice along the way. “I want to help encourage all women to get regular smears,” she added. Daffodil Day takes place on Friday, March 22nd. The Irish Cancer Society is encouraging fundraising events, volunteering and for the public to buy a daffodil to help cancer patients nationwide.